How many points B has? Strictly speaking, stones don't have 2 eyes, they are not attached. When counting points for black, should we account for it? i.e. Should we count that black will have to put stone on (and reduce score by 1) before can be considered dead? No, this is not different from any simple case of dead w stones in b territory ("having" 2 eyes is not a requirement in rules). 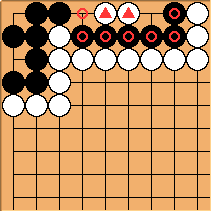 Since w can not do anything even going first (and b can do anything even going second), two w stones are dead as is. B could capture them, but doesn't have to actually do it (as that would falsify his score unless area scoring is used).